It’s not exactly breaking news that San Francisco has an abundance of great sushi restaurants. And the odds are good that your local go-to joint consistently satisfies your cravings for miso soup, shrimp tempura rolls, and Hamachi nigiri. 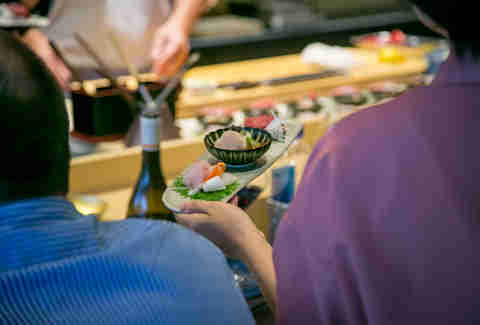 That’s all perfect for that once-a-month (or week, as it were) sushi dinner, but the city also shines when it comes to spots that cater to those looking for an experience that’s different than what so many of us have come to know and expect. 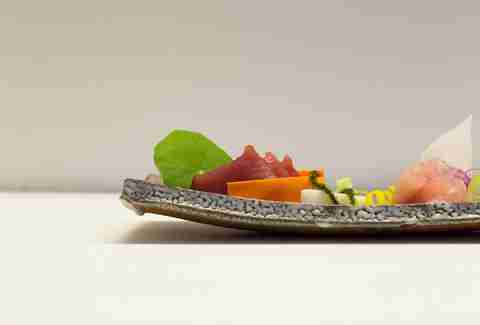 In some cases that means it’s a little more luxe, in some cases it means a lot more luxe ($500 omakase, anyone? ), and in some cases that just means inventive chefs with expert knife skills or the best place to go when you want legitimately good sushi at 1am. Whatever you’re looking for, here are our nine favorite sushi restaurants you’ll want to hit again and again. 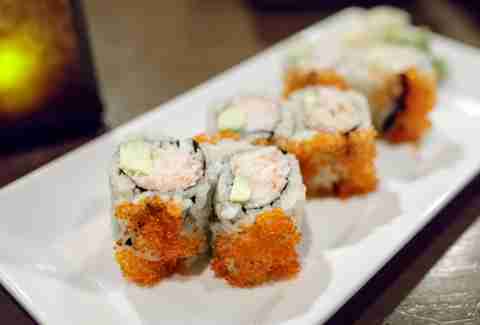 ICHI Sushi is a go-to for sushi lovers: The fish is fresh and sustainably sourced, the vibe is laid-back, and the service is great. Request the bar when you make your reservation (which you’ll most likely need since there are just 21 seats, including nine at the bar, which is where you want to be to watch and engage with the chef). You can’t go wrong with the reasonably priced individual dishes, but if you’re feeling adventurous and have a little more to spend, the omakase is consistently excellent. Sushi Ran in Sausalito has always been a popular spot to get sushi, but now you don’t have to drive over the Golden Gate Bridge to enjoy its most popular sashimi and maki rolls thanks to the opening of its sister restaurant in the Castro. The restaurant bills itself as a Japanese gastropub and though the menu isn’t as big as Sushi Ran’s, dishes like rafute (braised pork belly, shiraga negi, karashi miso) and soki (BBQ pork back rib, pickled red ginger, and karashi miso) are so flavorful and filling you won’t mind. Plus, unlike its Marin counterpart, Izakaya Sushi Ran has a full bar, which you’ll want to partake in since it includes a cocktail program featuring Awamori, a very strong and very smooth traditional Okinawan liquor that you won’t find in many cocktails in the US. Ju-Ni means “twelve” in Japanese and not-at-all coincidentally, that’s precisely how many seats there are in this Michelin-starred omakase restaurant. As if that weren’t intimate enough, the sushi bar is designed so that every four guests have a dedicated chef creating and guiding them through each of the 18 (with the opportunity to indulge in more) courses. On the $165 menu that changes based on seasonality and fish availability from the Toyosu Market in Tokyo. There are two seatings each night (6pm and 8:30pm) and they tend to sell out a month or two in advance. Just be sure to put your reservation on your calendar -- and maybe tattoo it on the back of your hand -- because any cancellations made within 48 hours of your dining time will incur the entire $165 charge. A kiss is just a kiss, unless it’s Kiss Seafood, in which case you’re definitely going to want a second date. Here’s the thing: if you want to dine at this intimate Japanese restaurant (and you do), you’re going to need a reservation. That’s just the way it goes when there are only 12 places to sit and enjoy the thoughtful and savory sashimi and sushi the chef is masterfully creating. There is an a la carte menu, but for the best experience, you’re going to want to go with one of the omakase menus ($70 and $89). This Michelin-starred 14-seat omakase restaurant is known for its elevated Edomae-style sushi and “classically Japanese” (read: refined and serene) ambiance. There are a few small tables, but the counter is where you want to sit so that you can interact with and watch the skills of chef Jackson Yu, a warm, engaging, and very talented master of his craft. Like the name suggests, there’s no set menu at Omakase; rather, diners choose from a $150 or $200 chef’s choice menu. The second includes a few more pieces of sushi and nigiri, which you’ll probably want considering the fish is handpicked by experts and imported directly from Tokyo’s world-renowned Tsukiji Fish Market three times a week. The words “Financial District” and “expense account” may initially put you off of this Michael Mina and Ken Tominaga (Hana Japanese Restaurant in Sonoma County), but don’t let them. 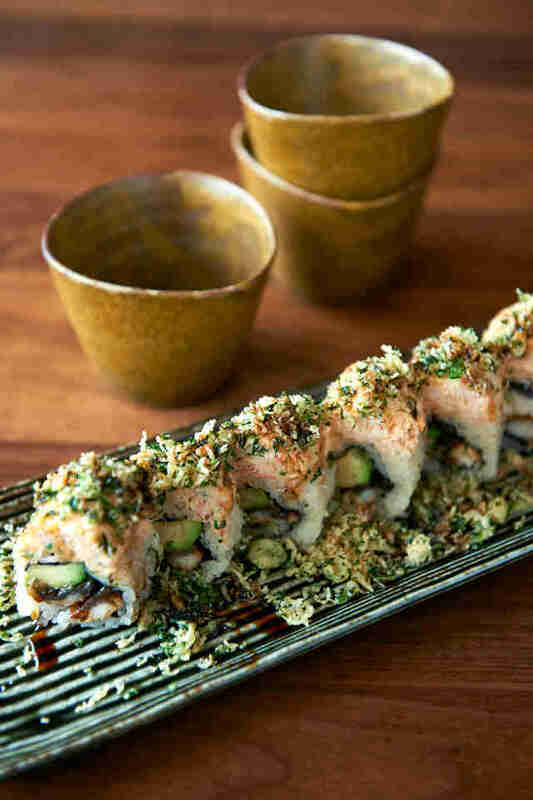 Pabu consistently puts out delicious and high quality sushi and sashimi, as well as grilled skewers and steaks. There’s also an omakase tasting menu (of course), and a really good happy hour with great prices and quality cocktails (especially if you enjoy Japanese whisky). Go for the latter when you’re paying and the former when it’s on someone’s company dime. 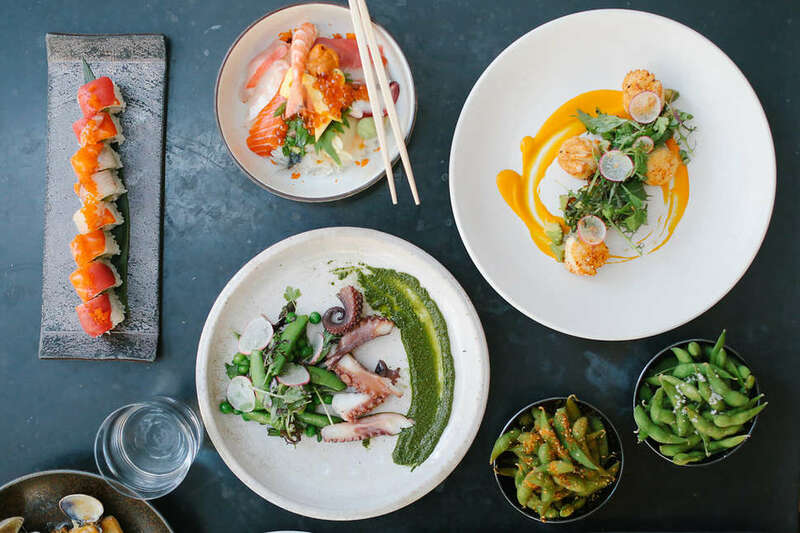 Whichever it is, you’ll find that Pabu is actually more affordable than some of SF’s most high-end sushi places and is nearly, if not equally, as delicious. In a town where sushi can often feel austere and serious (though usually in a good way), Robin is a breath of fresh air. 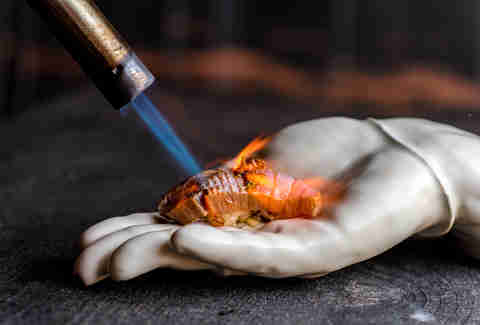 Chef Adam Tortosa’s untraditional take on omakase ($89 to $189) is unlike anything else you’ll find in the city with contemporary creations that focus heavily on local seafood and unexpected Northern California ingredients -- take the salmon nigiri topped with confit tomato for instance. Even the wasabi comes from nearby Half Moon Bay Wasabi Company, one of just a handful of wasabi farms in North America. The decor matches the unique cuisine with, dripping rose gold metallic paint on the wall, bright, colorful recycled tile on the wall behind the sushi bar, and a bathroom floor tiled in pennies that you kind of want to Instagram… but maybe shouldn’t seeing as though it’s a bathroom floor and all. Ryoko’s is probably the most controversial addition to this list, but when you’re looking for late-night sushi in a lively space that feels more like a club than a restaurant (there’s a DJ), this is THE place to go in SF. The subterranean (a.k.a. fancy basement) restaurant stays open until 2am every night -- you can order food until 1:30am -- and, as a result, draws in a mix of tourists and industry folks looking for legitimately good sushi that’s not too expensive. There’s almost always a line at peak hours, but the hostess will bring you drinks while you wait. There are plenty of over-the-top Frankenrolls with lots of ingredients, but the fish is fresh, so don’t shy away from the nigiri and sashimi. Daisy Barringer is an SF-based freelance writer who highly recommends not ordering the canned sake “Jell-O” shots at Ryoko’s no matter how much your best friend begs. Just trust her on this one and then follow her on Instagram @daisysf.